Over the course the last few months, as much as I’ve enjoyed scooting around on an increasingly powerful and nimble bike, one thing that always bugged me was the shaky and bone-jarring ride quality. Some of the road surfaces in my neighbourhood are in a pretty dismal state of repair, and it seemed that every bump, crevice and pothole would make the bike shake or lurch around drunkenly. The suspension always struck me as limp and wallowy, and yet – oddly – it also did a good job of transmitting road vibration through the handlebars, up my arms and through my teeth. Finally weary of this I took a look at the rather feeble shocks on the bike and considered that, though adequate for pootling along at 25 mph with the smaller, 48V battery bank, it might not be up to the job of charging around at nearly 50 mph with 48 kilograms of batteries on board. So as I passed my local bike shop recently, I thought I’d drop in and ask the staff there what my options were regarding upgrading the spindly looking affairs currently there with something a bit more substantial. The guy from the bike shop duly came out to take a look at it for me. He asked for the keys, unlocked it, bounced the bike up and down a bit and declared the rear shocks to be knackered. Only the springs seemed to do anything, the hydraulic-type piston didn’t seem to have any discernible effect at all. When I told him that that’s the way they’d been from new, he just said they were obviously rubbish, then, which I had no problem believing given the manufacturer’s tendency to keep prices rock bottom by using the cheapest parts they could get their hands on. This said he said he could order a decent set fo £50. I knew I could probably get them cheaper if I researched them and spent a while trawling the internet, but I have less time nowadays and a bit more cash, so I thought I’d just leave it to him. A none too swift ten days later, I was the proud owner of a new set of MDI brand shock-absorbers. They werereassuringly beefy looking, with a sparkly, chrome and gloss-black finish. They didn’t look much like the one pictured on the box’s lid, but I wasn’t at all bothered about this because I much preferred the on that was actually in it. 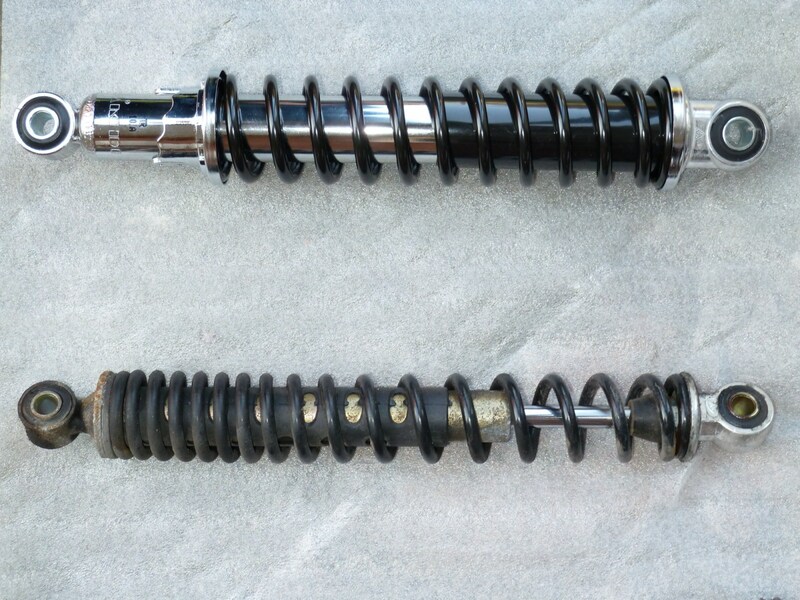 As you can see below, the new shocks are quite a bit more substantial, with a solid, thick, hydraulic slider that is in stark contrast to the spindly assembly it replaces. It was only a half-hour job to remove the old ones and fit the new ones. 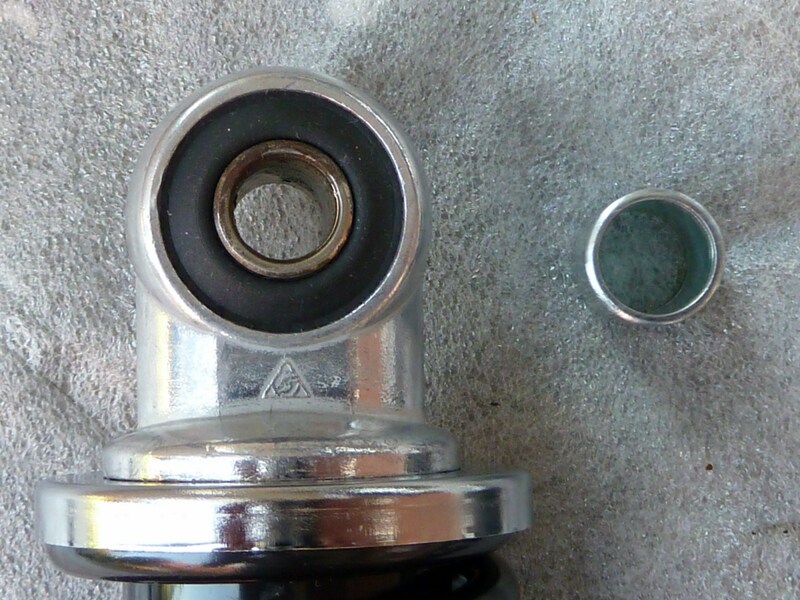 They’re attached – top and bottom – to the frame by a simple, thick nut and bolt, and my ratchet socket set plus a spanner made short work of it. All done, and looks great! As soon as the bike had finished it’s home-from-work recharge, I eagerly hopped on board. Straight away I noticed a differencein that the whole bike didn’t simply flop three inches onto its soggy springs. It sat firm, and with its rear an inch or so higher – another boon since the ride height was all the better for my six foot frame! Taking it for a spin over some of the less hospitable surrounding roads, I was delighted to see that it’s handling was much more steady and firm. I was concerned that the stiffer suspension might make the vibration even worse, but clearly the “ISO 9001 certificate” that the box proudly announced did actually mean something, as the ride quality was substantially improved. It had a more solid, ‘big bike’ feel now, was much more sure of itself over uneven surfaces, and the wallowing and lurching was all but gone. Road vibrations, were much softer now, and the lack of bone-jarring harshness to its protests as it negotiated the rougher patches was a blessed relief! I really couldn’t be happier with this upgrade, and think it’s worth every penny of the money I spent on it. 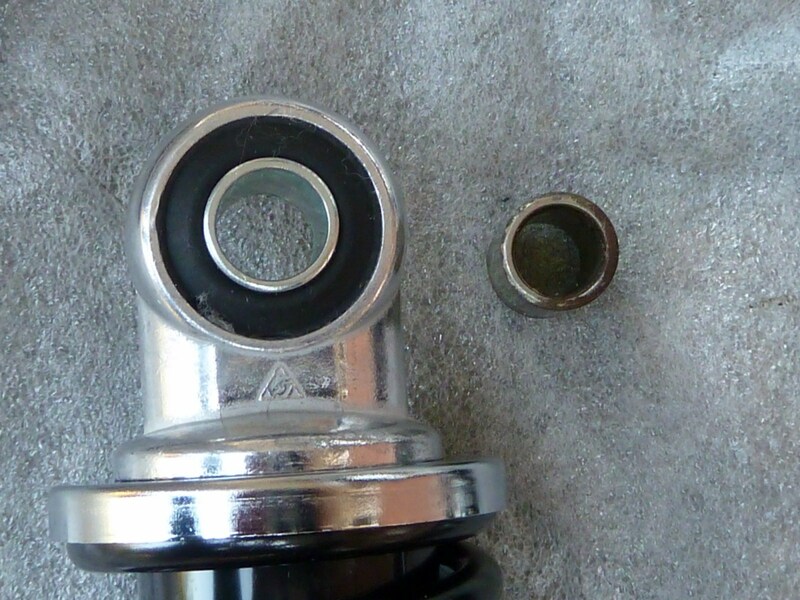 If your suspension pistons are as rubbish as the ones that originally came with my own Scoota, then I’d strongly recommend taking care of this if you plan to upgrade – or already have upgraded – to 72V and/or a more powerful controller. 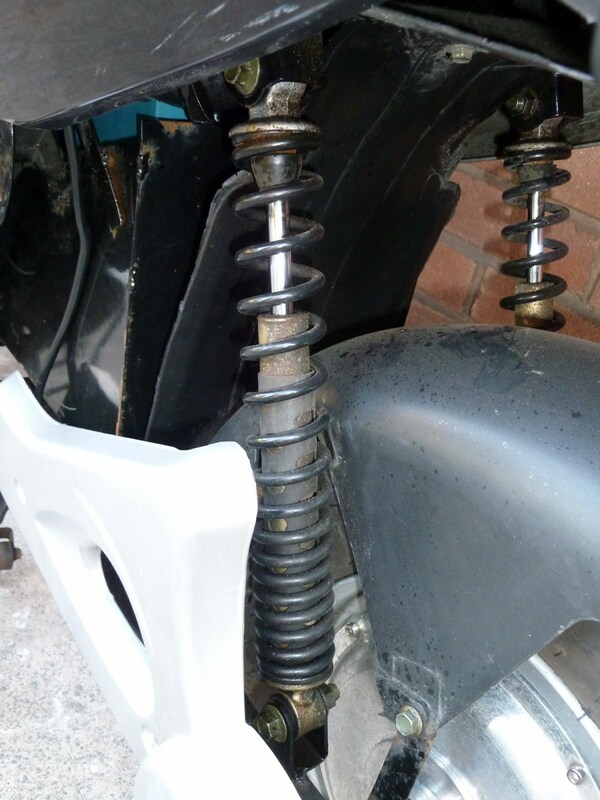 The original suspension, I think, was barely fit for purpose for the bike in its 48V form. With the added weight incurred by an upgrade, and the higher speeds it has to contend with, I’d almost call this upgrade a “must”. 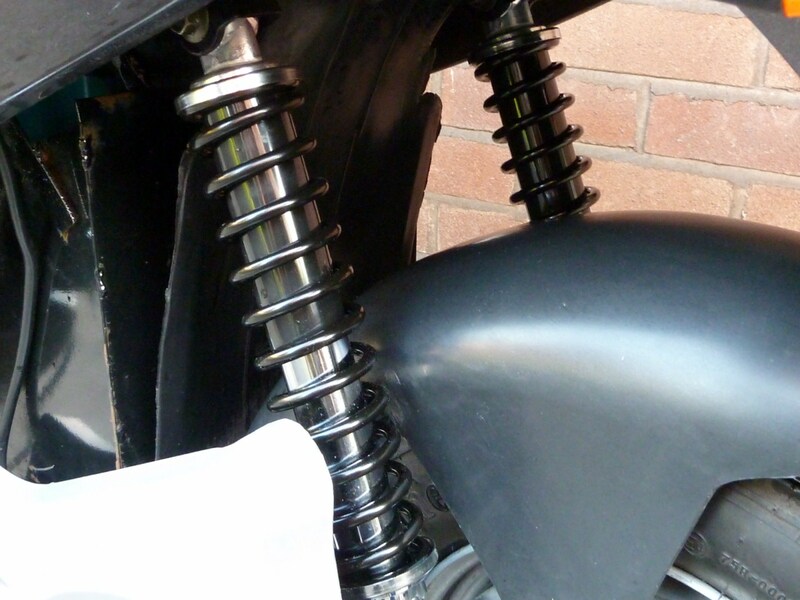 For the benefit of anyone looking for these, it’s been brought to my attention that they are available at the time of writing (and cheaper) from here, where they are referred to as “chrome shock absorbers Suzuki A50 Moped 71-76“. However make sure that they give you the right size! 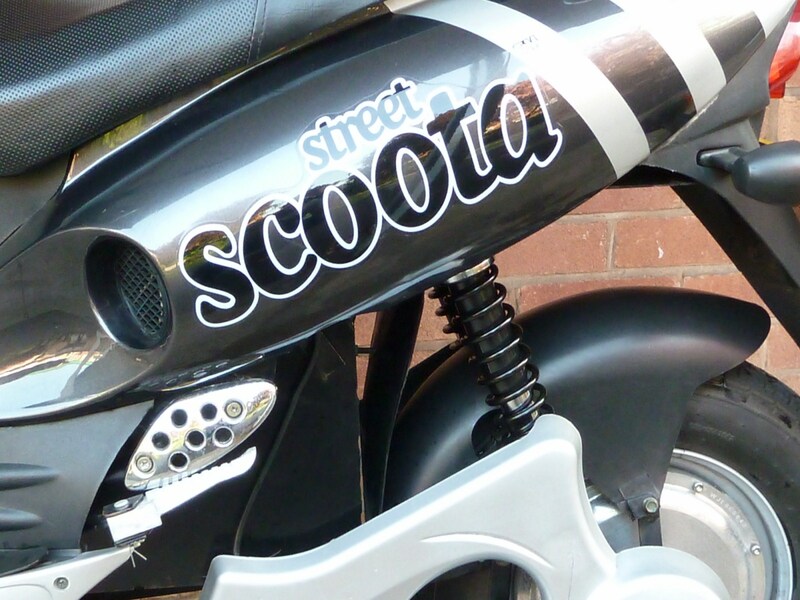 – The length you need for the Ego Scoota should be 310mm., however an owner of the UK Eco Scooter (which is very similar) reports needing 335mm ones. It’s best to measure these to make sure your replacements match the originals (you take the measurement from the middle of one hole to the middle of the other). Now that the resistor mod was in place that would give me my regen braking at 72V, and my lvc and regen settings were set up accordingly, it was finally time to take the bike for a test-drive. 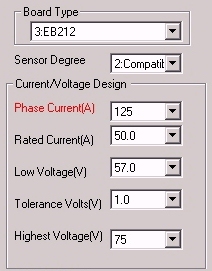 But there was one more thing to consider – how high I should set the rated and phase amperage in the controller settings. Everyone I knew was using the customary formula of setting the phase amperage to 2.5 times the rated amperage, but the question remained about what basic, rated amperage I should start off with. 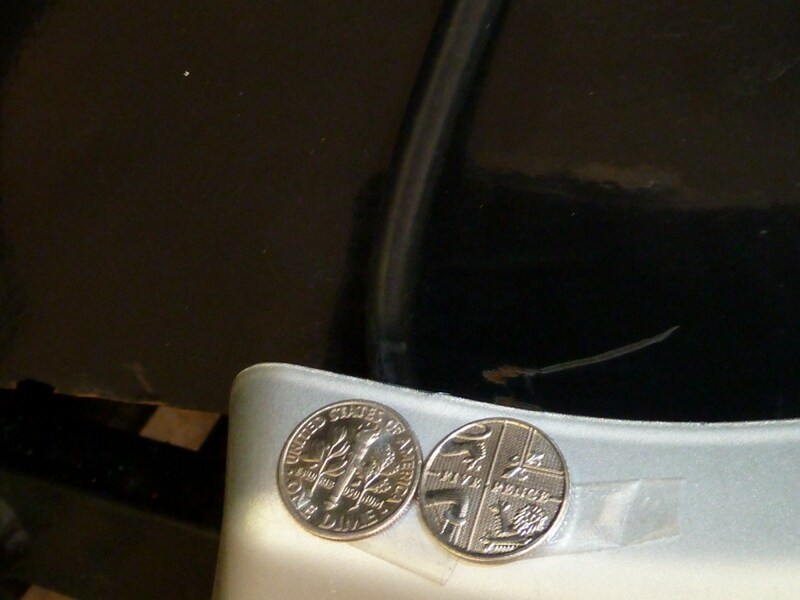 According to Lyen, the controller was capable of taking a sustained current of around 60-65A in its unmodified form, but I knew from the experiences of others that anything above 40A might be pushing it simply because of the fairly thin phase wires running to the hub motors on these bikes. 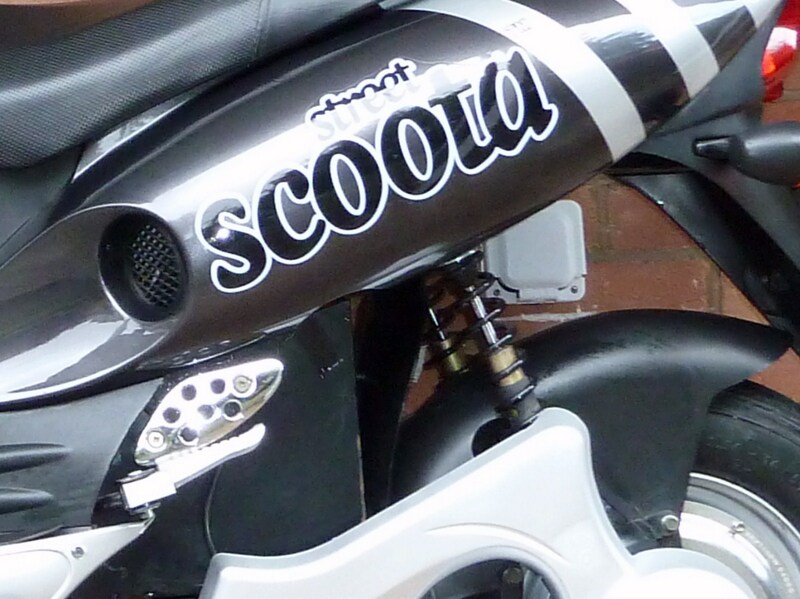 The motor on the Ego Scoota was nominally rated “1400W”, and was assembled with a mind to its original 48V SLA bank and 35A controller. Consequently little was spent on the wires required to handle this, and they have a tendency to get quite hot if the motor is pushed too hard. The name of the game in souping up these bikes, then, is to pay close attention to the temperature of the phase wires while gradually upping the current level on the controller. Others who have upgraded to better controllers have therefore been quite diligent in monitoring these temperatures, usually by nothing more complicated than feeling how hot the phase wires (and the motor hub) are to the touch. 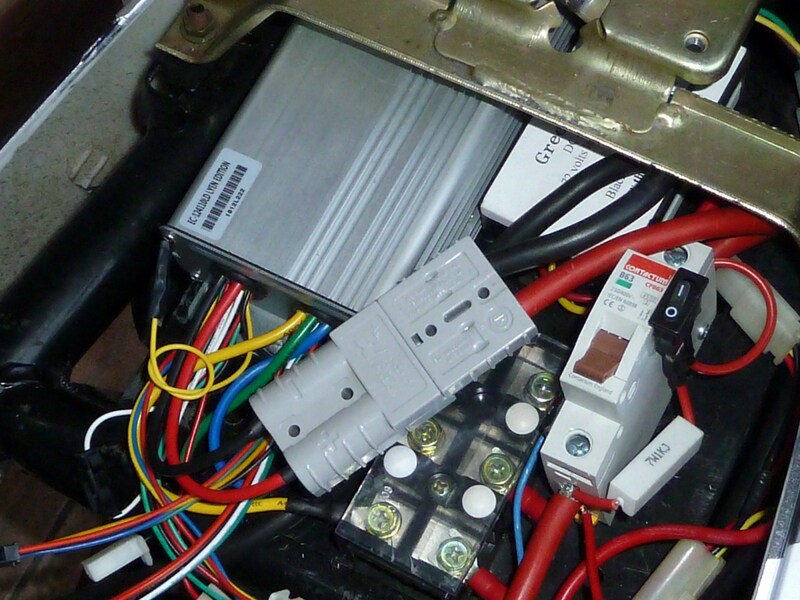 Another rider on the Electric Motoring Forum, with the same bike, with the same wiring upgrades (wires on the battery bank are 170A welding cable) and a similar 4110 12-FET controller reports that he’s running his at 40A. So with this in mind, I decided to start out at a slightly more adventurous 50/125A – that is – a rated current of 50A and the phase current set to a 2.5 multiple of this – 125A. This was, I felt, pretty much at the limits of my bike’s capabilities given the feeble phase wires. I resolved, though, to be gentle on the throttle at first and check my phase wires very regularly to see if they got uncomfortably hot. If things looked in danger of overheating, then I would just ramp things down a little. The budget 72V ‘McControllers’ that I have been using (and now sell) – though fine to get you up and running with more power and speed – are not built with the same quality components or range of features that are offered by controllers with these superior “infineon”-style boards. The LYEN Edition controller, though, with its premium grade IRFB4110 MOSFETs and good, solid tracks, can pack a good deal more punch. Setting off along a nearby dual carriageway I was taken by how much better the acceleration was, and how swiftly I topped the 40 mark on my clock compared to before. The vastly superior pull-away was an absolute boon in traffic, as I could sneak through to the front of the line waiting at traffic lights and dash away and ahead as soon as they turned green, without fear of some obnoxious driver trying to out-accelerate me and cut me off just out of malice. Any lingering resentment about my unit arriving without regen working – and having to perform the necessary resistor mod myself – was gone within about 30 seconds. ‘All is forgiven, Lyen!’ I thought. This inaugural run was also exciting for another reason, though: I would finally get to experience the regenerative braking that I’d heard so much about. I did wonder if it might be too harsh, as some people have complained, but fortunately the resistor value Mike recommended seemed to be spot on! As soon as I eased of the throttle, a subtle but distinctive braking effect kicked in, much like the ‘engine braking’ that you get with ordinary petrol engines. And like with ‘engine braking’ it was a little harsher at high speeds and gentler as you slowed down. An added feature that I absolutely loved was that at around 10-15 mph, the regen would ‘let go’ and allow you to coast gently to a halt with the help of just a gentle squeeze of the brakes. I was delighted with this as it proved that the resistor modification that I’d nervously done on the board had done its job. The 90V regen gave me the ability to extend my range a little by ‘using’ hills to claw back some of the energy I’d spent climbing them. Even better, with judicious use, I could greatly improve the life of my brake pads by allowing the regen to do the lion’s share of the braking for me, turning all that forward momentum back into useable energy again, – a true delight for any environmentalist! This preamble done with, it was time for the speed-test I’d been so looking forward to. After giving it a nice full charge, I decided to put it properly through its paces with a good long run. This second test run covered a total of 14 miles total over various types of terrain, and I took my satnav with me, mounting it onto the instrument display, and also plugging it into the accessory socket I’d fitted into the little glove compartment. 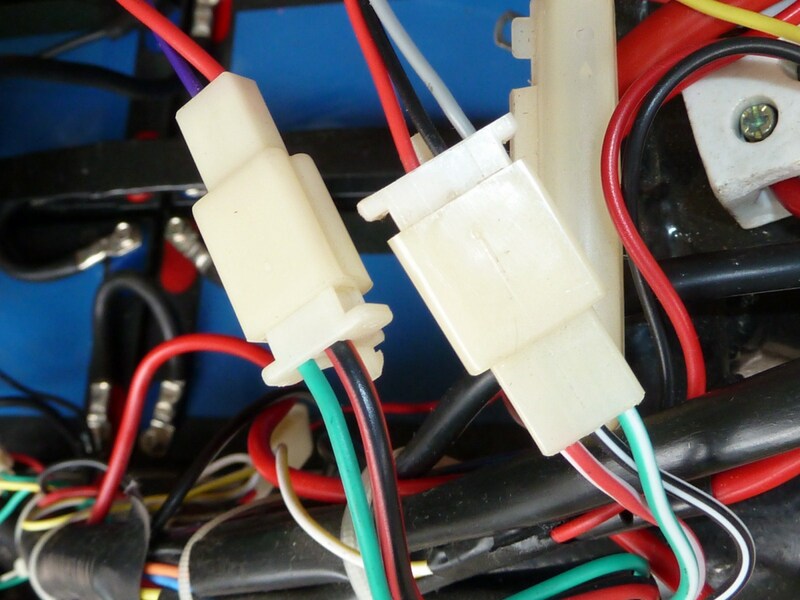 This was more as a safety net for if the satnav’s sucker cup came loose, than to provide power, as the connector was more than strong enough to keep the unit tethered to the bike if it fell off the dash! The satnav confirmed, as before, that the speedo reads about 12-15% over actual satnav (more accurate than the factory version, due to my slightly bigger K-62 tyres). With it’s topbox on, it wasn’t in the best condition for a speed-test, as this acts as a massive airbrake at higher speeds, but three miles into a fresh charge, I topped out at about 41-42 mph ( as measured by satnav) on the straight, 43 mph with the help of a downhill gradient. The clock was nearly off the scale at this point, reading just a squeak short of 50 mph! This was a 4-5 mph improvement on the bike’s performance with my budget 72V controller. I later took off the topbox and redid the speed-test. This time I was getting 43-46 mph (satnav), topping out at a new personal record of 48 mph with the help of a hill. That would be 50 mph+ on most speedos! As I put the bike through its paces, I was very mindful of the issue of the skinny phase wires, and regularly pulled over to check the temperature, especially after I’d done full throttle for a few minutes. They were warm, but not worryingly so, even further up the wire towards the junction box (where it seemed to get hotter for some reason). As they say, though, the light that shine twice as brightly shines for only half as long. Dashing around full throttle at this setting consumes a great deal more power and quickly drains the batteries, and I only had about 12 miles of high-powered fun before performance started to tail off and hill climbing lost its lustre. A voltage measurement after my full 14 mile run revealed that I was down to 73.8V, which would leave probably another four to six miles or so before it started to conk out. If I had been easier on the throttle. I would no doubt have got plenty more range, but at the end of the day its a trade-off between power and range. One weird thing I did notice a couple of times though, was something that cropped up after I’d been running it hard for a while. If I yanked open the throttle from a full stop or very low speed, the motor would cut-out. It wouldn’t have it unless I opened up more gradually, and then fully once I’d got moving. I’m pretty sure I’ve got this figured out though. After some experimentation – including a brief foray into running the controller at 55A, I decided that what was happening was most probably down to overtaxing the limited delivery capacity of the SLA batteries I’m using. Whenever you draw power, the voltage sags, sometimes quite considerably, and I can see this on my LED power monitor which fluctuates quite a bit, dipping as I accelerate and then returning to a nominal level as I ease off the throttle. With the added current that I’m pulling from the batteruies, the voltage may drop low enough to trigger the LVC (low voltage cut-off). This is consistent with the fact that it seems more prone to occur after a prolonged period of flat out driving, when the batteries are struggling to keep up with the demands. All in all, I was more than happy about the LYEN Edition controller. In addition to delivering excellent power, and the programming features that allow the user to tinker with all manner of settings via his extended version of the Keywin interface, there is also an upgrade path for more adventurous users who want to push the controller to its limits. Reinforcing tracks on the board, adding thicker wires and modifying shunt values can make the controller capable of pulling up to 100A and 100V, it is claimed. The unit I felt was great value for money and was shipped and delivered incredibly fast. My main gripe was the fact that the controller had not been set up so that regen braking functioned out of the box on my 72V system. I was also puzzled about the lack of a 12V ‘high’, brake cut-off wire of the type that comes with any bog-standard controller. 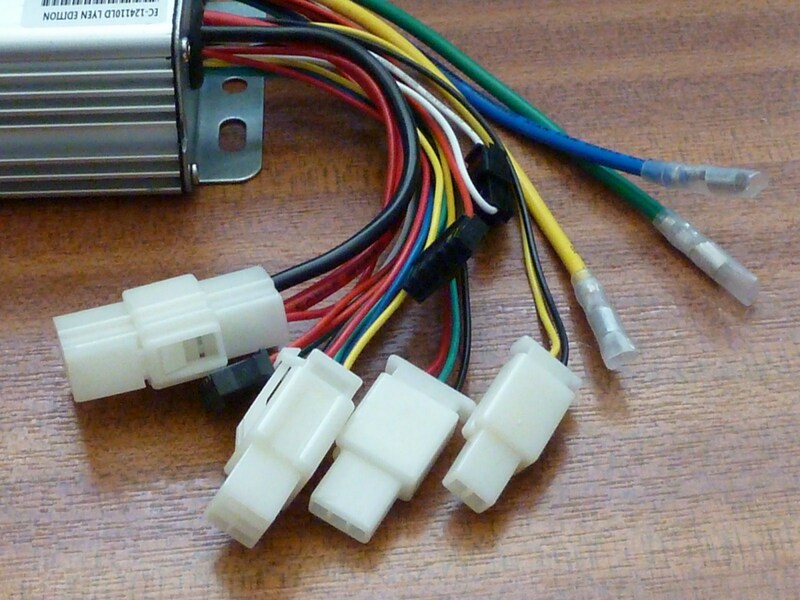 The lack of this was not especially important if you used regenerative braking, but the e-brake connector he included could not easily be incorporated into my bike’s systems, as it required a switch like the one on a brake lever that was already in use by my bike’s 12V system. Apparently the lack of this feature is due to the absence of a BC-107 transistor on the EB-212 board, which will need to be added to get this feature working. With so many other excellent features on this controller, such as the USB and cycle analyst interfaces – both of which are far more complex – I couldn’t understand why Lyen would neglect to also include the type of brake cut-off that even the cheapest controller has included as a matter of course. Perhaps he felt that his existing e-brake and regen features just made it unnecessary, but a 12V high cut-off of this type isn’t just for the brakes, it’s also an essential feature of many BMS systems for Lithium battery banks. Though Lyen was very attentive generally and gave excellent feedback and help, he sometimes took a day or so to respond, which left me chomping at the bit and impatient to get to work on things while I had the time available. The issue with the regen braking, I felt, was a lapse in his otherwise excellent communication. He knew I was running off a 72V system, and that I wanted regen, so the resistor mod, I think, should already have been in place. This isn’t a problem for a reasonably competent DIYer such as myself, but a more timid customer might have been left with no option but to return it to be fixed, incurring quite expensive mail fees. The lesson here, then is to expressly ask Lyen for the resistor mod to be included if you are using a 72V system or above. 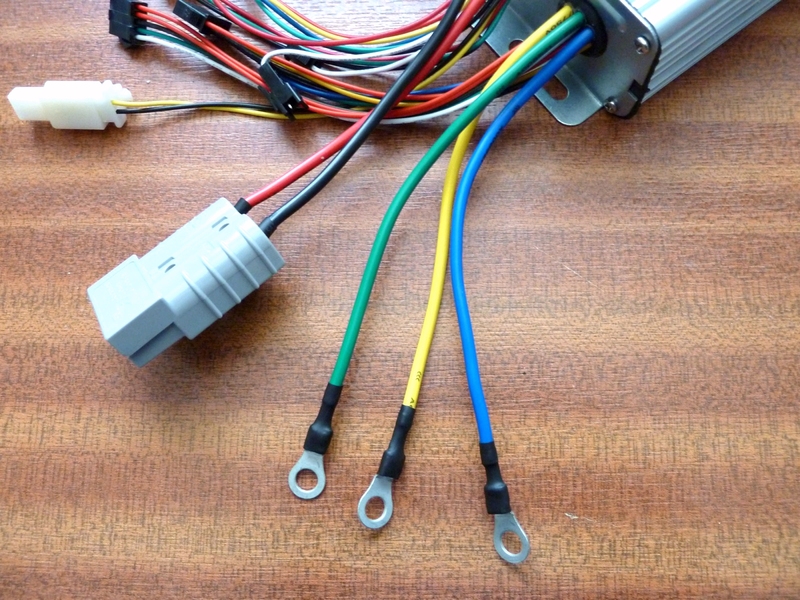 If you want the 12V ‘high’ brake wire included, then likewise this should be expressly requested. For quite some time now, I’ve been planning to get hold of one of the more expensive, powerful, high-end controllers such as the Ecrazyman ones that are so frequently talked about on E-bike forums. While the stock, ‘McController’ that I’ve been using has been a great improvement on the factory 48V unit that came with the bike, and was great to get me up and running with more power, it still restricts the current to a fairly cautious level, and is rather too gentle on the acceleration for my likes. It also offers only basic features and can’t be programmed and configured the way you can with ‘luxury’ units. 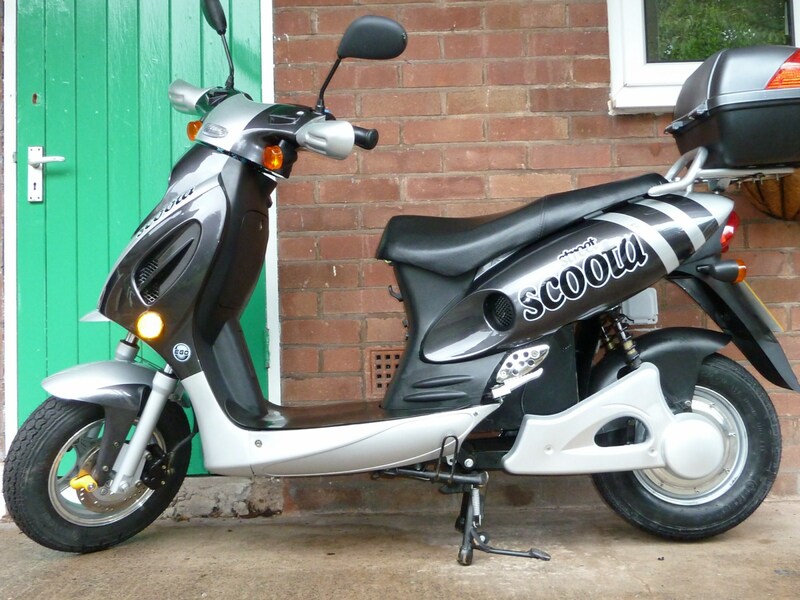 I was also just barely cracking the ‘true’, satnav 40 mph mark on my scooter, and – though this was a great improvement on the 28 mph it did out of the factory – I wanted to see if I could push myself up a little closer to 50 if possible. 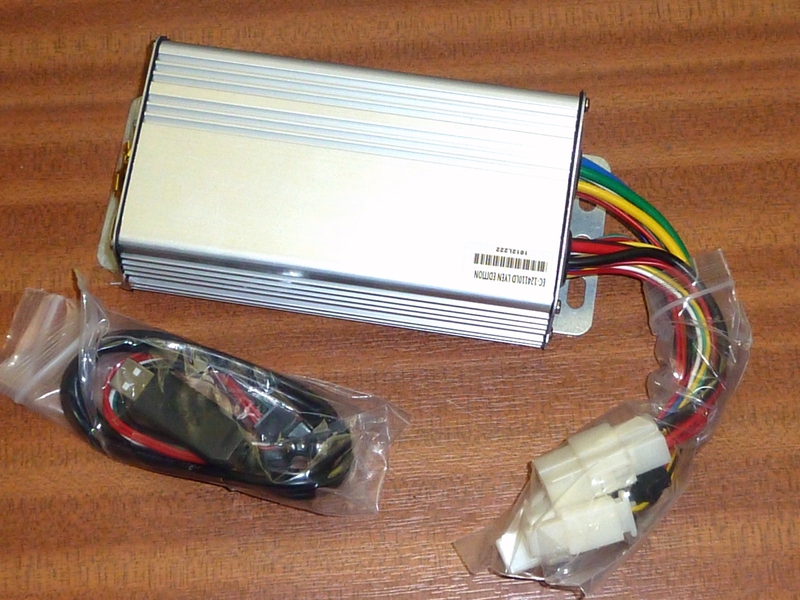 I’d heard a great deal about a person known as Ecrazyman who is quite well known in e-biker circles from building and selling controllers and chargers, which can be found on eBay. However he is not the only one making such controllers. Another guy by the name of Lyen – who can be found on the Endless Sphere forum where he does much of his trading and correspondence with buyers – also offers to build and supply high-end controllers that can be configured and upgraded to cope with as much as 100A continous current to suitable motors. He enjoys a very good reputation on this forum, and has clearly sold a lot of things to very happy customers, so I was more than happy to approach him about supplying me with one to my own specs. So, just a few short day ago, I contacted him on the forum by PM to enquire about his LYEN Edition controllers. 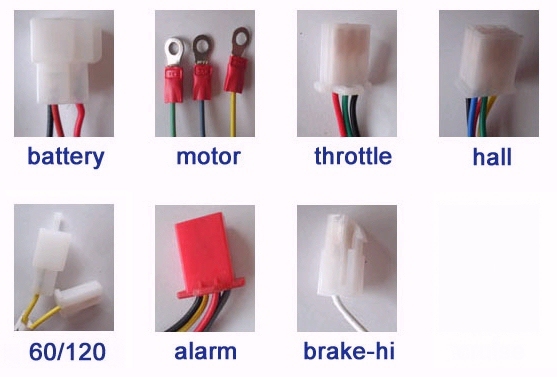 I asked which type he would recommend, (9-FET, 12-FET or 16-FET) for my particular bike and bank voltage, bearing in mind I might upgrade to a Lithium battery pack or want to make other upgrades to pull more power to the motor. I asked for a quote for one with the superior IRFB4110 MOSFETS that are the heart of the controller, and capable of regenerative braking on my system. I also wanted the USB/TTL programming cable, which he was also offering at a very reasonable price, as it would save me the tedious task of building one myself. Others on Electric Motoring Forum and elsewhere had built their own, but I really didn’t have time for this at the moment. He got back to me recommended the mid-range of his three boards, including a Paypal request and asking for confirmation of the voltage I would be running it at, presumably to set up the LVC (low voltage cut-out) to something suitable in the first instance. It was at this point, though, that I began to wonder if I was going to get my regenerative braking all working as I wanted it. Many people on Endless Sphere were talking about the PCB board on his controller requiring a resistor modification before it could produce the voltage required by a 72V battery bank, and I was concerned that he would ship this unit without the necessary change being done. 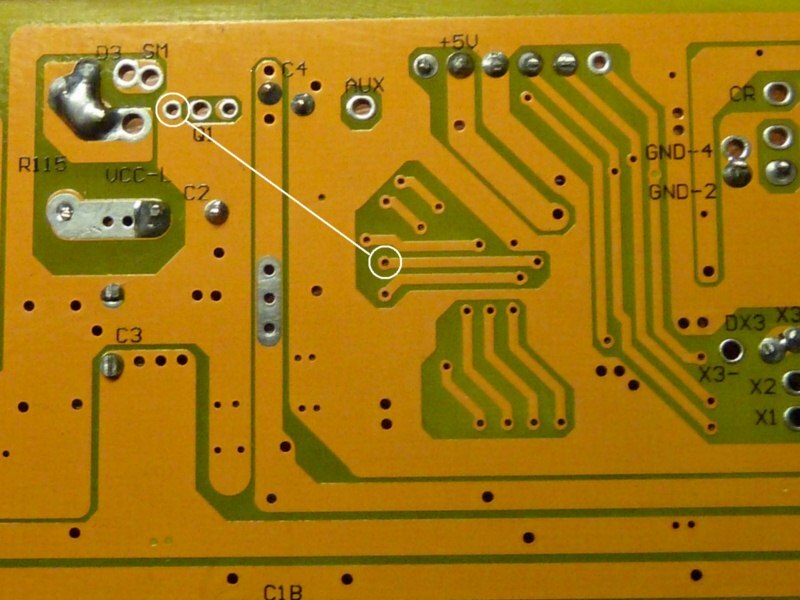 I also wanted to double-check that I’d be able to run it at the 65A that I wanted to eventually get my bike working at, and that I could do this without any nerve-wracking jobs like reinforcing the solder tracks on the board. I promptly sent him an email asking for confirmation of this, and hoping for the swift reply I’d received before. But both Saturday, then Sunday came and went without any reply, and I started to get nervous. I sent a final email Sunday marked urgent and headed “PLEASE ANSWER MY QUESTIONS”. To my annoyance – and just as I feared – he replied that he’d already sent out the controller, and that if I wanted any modifications made, I should have asked for it before the unit was it was shipped, and not afterwards. He did, however, reassure me that the unit came equipped with 4110 FETs, as requested, and that it was capable of drawing a sustained 65A without further modification. San Francisco to UK in under 48 Hours! Happily the regen issue was the only real gripe I had about the unit and the way things were handled. Lyen is to be commended on the extraordinarily fast preparation and despatch of this unit. The very day after his email telling me it was shipped, it arrived on my doorstep, which did much to placate my annoyance about the absence of the resistor mod needed to get ‘regen’ working. All the connector counterparts and fresh pins are included! The Lyen’s controllers use the XieChang (“Infineon”) type boards, the same type as Ecrazyman and many other brands of controller. This makes sense and is also handy, as they can all be programmed in the same way and support the same standard range of features, such as cruise control, three switchable speeds and ‘high’ and ‘low’ cut-off features to enable them to be disabled and enabled externally, such as by the brake’s 12V circuit (which enables you to cut power to the motor whenever the brake is engaged). The problem also, is that all of these boards share the same ‘bug’. They will only support regenerative braking voltages up to a maximum of 75V, and this isn’t enough to enable regenerative braking for anything above a 60V system. To get round this problem, there is a simple hardware modification that can fool the board into providing the higher voltage required. A 1.2KΩ resistor on the board called “R12” can have its value lowered to raise the programmed regen voltage by a proportionate amount. This though, would also raise the programmed LVC cut-out level by the same amount, so this would have to be modified in the program settings too. 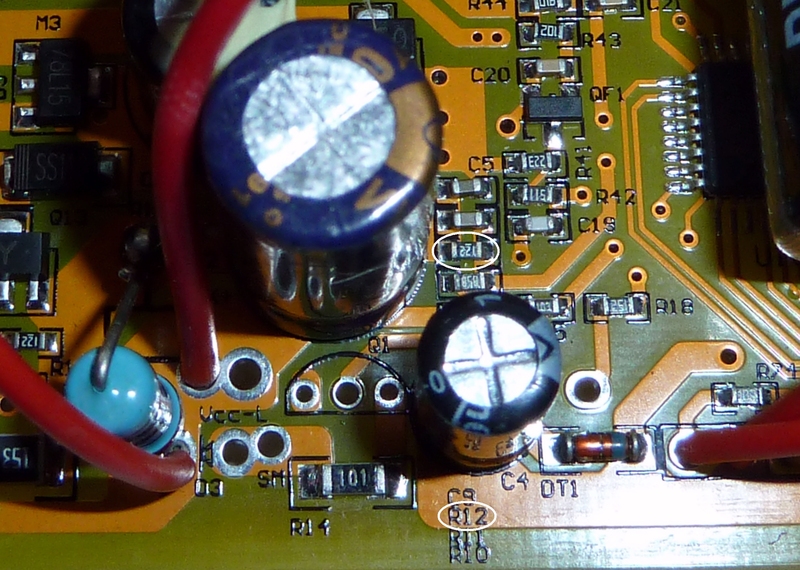 The famous R12 resistor (circled) on the EB-212 board, which renders the unit ‘hackable’ for higher voltage regeneration. I posted a message asking if our resident electronics guru knew how to do the resistor mod for these newer types of board, but he said it was just a case of figuring it out for myself with a multimeter. He did say, however – as stated in the documentation and elsewhere on Endless Sphere – that I should run a resistor of about 6KΩ in parallel with this one, effectively reducing it from 1.2KΩ to 1KΩ, to give a scaling factor of 20% for both the regenerative braking and the LVC. In other words you multiply your program value by 1.2 to get the actual value (or multiply the REAL voltage you want by 0.84 to get the program value). So setting the regen voltage to “75” will then give an actual 90V regen voltage, which is about what we want for a 72V system. A side-effect of this, though, is that a similar adjustment must also be made to the lvc. To get an actual 68V LVC value suitable for a 72V system, you need to enter the setting of “57” into the programming interface. 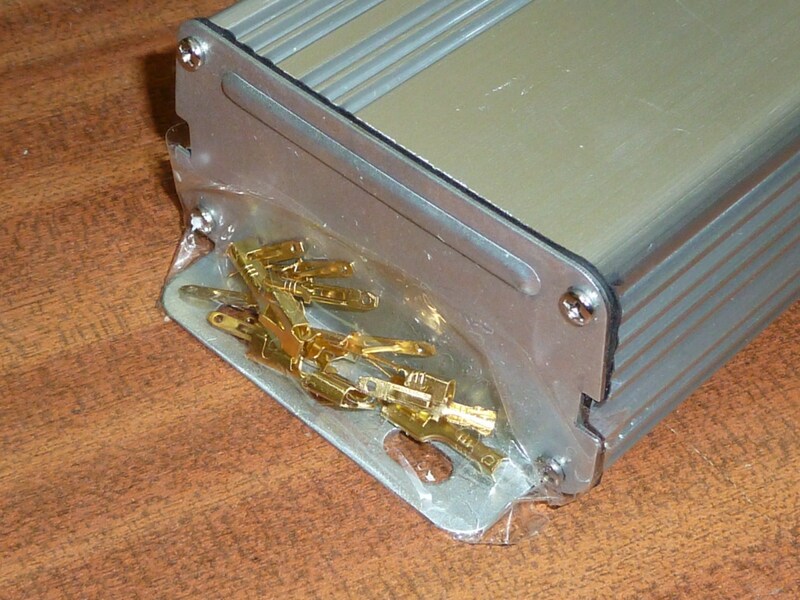 Finding a site to mount the resistor was all new to me, but was also common sense when you think about it. 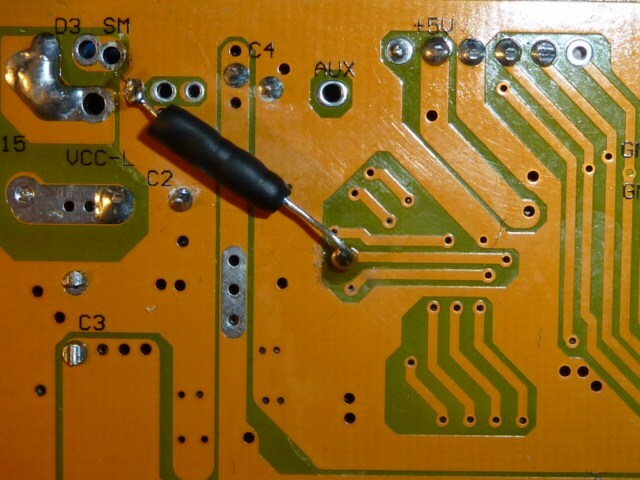 The tiny SMC (surface-mounted component) resistor meets with tracks either side of the board that can be followed by putting the multimeter into continuity tester mode. I had already been told that one of these would be one of the GND points on the board, and the track from the other leg went straight to a little hole further up the board. After a lot of fiddling around testing various ground points on the board, I eventually had two holes on the board that ran parallel to the R12 resistor, and which gave a reading of 1.2KΩ or close enough. Just as a reality check I temporarily mounted a 2.2KΩ resistor across these points by just wedging the legs in the holes, and measured a ‘combined’ resistance of about 780Ω which is about right, by my calculations. 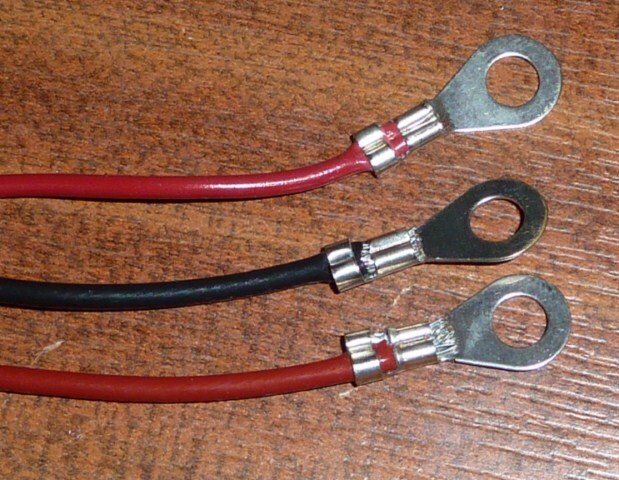 The closest resistor I had in my collection was a 4.6KΩ one. I could have just soldered this onto a couple of other resistors to get a value approaching 6KΩ, but this wasn’t very elegant. Instead I went and bought a 6.2KΩ one (and a couple of spares). Eager to get everything up and running, I carefully soldered this on. It was quite fiddly because of the quite narrow track, but I eventually got it attached nice and tidily with a bit of heatshrink covering it as a precaution. A meter reading now showed the expected R12 value of about 1KΩ, giving me the 20% scaling factor I need for lvc and regen voltage (with the 6.2KΩ resistor this was actually 19.3%, to be precise). Time for a test run! Finally I was all set to replace my 72V McController with my great new Lyen’s Extreme Modder. This was not as simple as a stright swap, though, as the Lyens controller was a bit shorter than my old one and wouldn’t meet up with the same hole in the base plate. But five minutes with a drill gave me a new hole in just the right place to securely bolt my new controller. Then it was just a case of plugging everything together. Up and running – The LYEN Edition controller is finally wired into my bike and ready to go! I was more than a little nervous that my resistor mod would have the right effect and so I decided to run a couple of tests to make sure it was behaving as predicted. At first I left the regen self-connector disconnected, just to be on the safe side. I’d already got the controller programmer software installed and working on my desktop and my laptop computer as per the instructions at the links Lyen had provided. 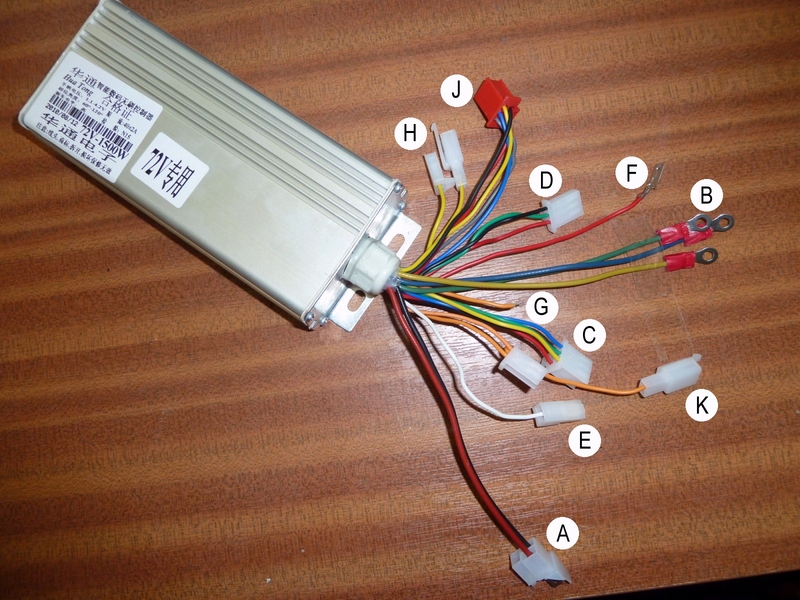 The software was basically a version of the “Keywin E-bike Lab” program that Ecrazyman had put together to enable users to program his own controllers (Parameter Designer.exe), and – presumably – any other controller that used these types of boards via a suitable cable. 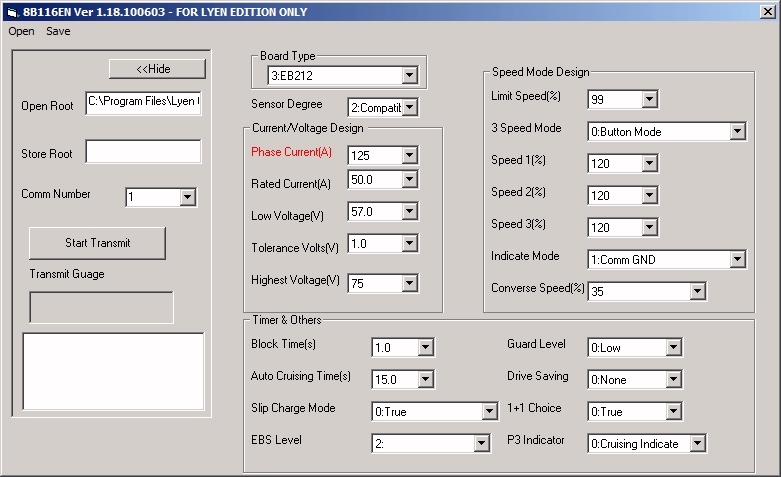 Lyen had his own customised version of this software which would allow an extended range of current and LVC settings way above the ones permitted in the original program. To make absolutely sure that my modification worked, I decided to put in adjusted values for the LVC and see if the bike would come on – or not – as predicted by the current charge state of the batteries and the LVC setting I had specified. First I set the LVC setting to something below the 79V that my fully charged bank. I put in a setting of “60”, which translated to about 71.5V (1.193 x 60). The bike started up and turned over fine. However the real test was to set the LVC slightly above the current voltage, as the bike may have worked whether or not my 20% scaling factor had been working the way it should. This time I raised it to “66.5”, the maximum allowed by Lyen’s version of Parameter Designer, which should have taken the actual LVC to 79.3V – just a little above the voltage of the bank. If my mod had worked, the controller would now cut off because my voltage was below the 79.3 cut-off point it was expecting. B – Phase Wires (Bl, Gr, Y): To corresponding wires on connector block. D – Throttle Connector (Bk, Gr, Red). Warning! – Wires in connector may be reversed. You are currently browsing the Zenid's Ego Scoota Blog blog archives for April, 2011.